"Provides practical, hard-won advice for how prospective and even in-the-trenches social entrepreneurs can leave the world a better place. This is a book you will not want to miss!!!" "Whether you are an experienced social entrepreneur - or just thinking of becoming one - Creating Good Work is a powerful read. It provides practical insights on key elements that will build successful businesses, and reminds all of us why we're doing what we're doing: the desire to create a better world for all of us." "The one-of-a-kind Creating Good Work offers those of us interested in 'deliberately disruptive design' inspiration, and wisdom from the most potent leaders of our time. It will inform my thinking about what REDF is trying to do now, and our practice for years to come. You have done an incredible service by compiling in one place practical lessons and a framework for everyone engaged in a lifelong study of how to improve our world." "Creating Good Work is a must read for any student considering a meaningful, purpose-driven career in business. Why live your life any other way?" "Building a healthy economy requires a commitment to making a difference in the world. Creating Good Work provides powerful and inspiring examples of how that can take place." 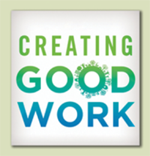 "At Goodwill Industries, we've always operated by the dictum of creating good work. Creating Good Work is a clear demonstration of thought leadership and innovative practice in the realm of social enterprise. For more than a century Goodwill has used disruptive design techniques to create new paradigms, develop an agile workforce, and drive economic impact in the neighborhoods and communities we serve. Creating Good Work will serve as a GPS for 21st century social innovation." "Ron Schultz has done a great job of compiling and illuminating an A to Z read that encompasses theory, application and practice, peppered with lots of pragmatic advice. Creating Good Work provides a needed pathway that leads us from thought to essential action as it helps readers explore and develop transformative ways to influence social change. It's an informative and important read for all who are interested in finding a new way forward. - Beverly Schwartz, author of " Rippling: How Social Entrepreneurs Spread Innovation Throughout the World " , and VP Global Marketing, Ashoka. "If you are interested in Social Entrepreneurship as an entrepreneur, a student, a teacher, a politician, a funder or simply a citizen of a world that needs to create good work then read this book. Maybe not all at once, there is too much here for that. Read what you need, when you need it and you might find yourself becoming a peaceful warrior in the battle to change the world, one disruptive step at a time." "Creating Good Work focuses on "social innovation", which is the third largest pillar of innovation within our society. Our ability to create good work in the social innovation sphere will be the absolute decisive challenge for our next generation. This is especially true in terms of building our future economies. The only resource that will really count will be: how well will people be able to develop their own capabilities? With this wonderful book, Ron Schultz provides a practical and pioneering work on this subject." "All entrepreneurship should be social, it should advance a social good. But often, it is merely opportunistic, harnessing impulses over choices, addictions over needs. Creating Good Work shows how to disrupt harmful business practices, deliberately, through innovations that create value for everyone. A rich mix of the theory and practice of social entrepreneurship, Ron Schultz's new book provides a framework for how to meet today's needs and tomorrow's." "Today just good enough. . . no longer is. A bold goal, like ending childhood hunger, requires a new outlook. You are invited to be part of a better answer and discover through the life stories of those who have touched and changed our world - that new horizons of possibilities are within our reach. This book has the impact of defibrillator paddles on your worldview of what good work is. Your eyes will be opened to new possibilities!"